Shawna Arnold and her boyfriend were on their way to Concord Hospital to deliver their baby girl. But, as we know, sometimes babies just won’t wait. Little Katie was one of those babies. 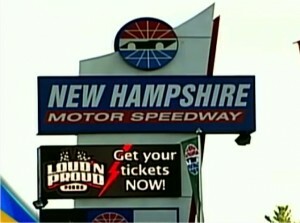 Shawna’s water broke just as they were approaching the New Hampshire Motor Speedway, so her boyfriend pulled into the speedway front parking lot. “You can’t panic, so you’re thinking, ‘What do I have to do at that moment to save this baby’s life,’” Shawna said. Shawna’s boyfriend made the right decision and ran to the speedway’s main office to ask for help. As fate would have it, there were EMTs on site for an event taking place that day. New Hampshire Motor Speedway Director of Operations, Tom Blanchette, who had a background in EMT services was also there that day. He rushed to the front parking lot and helped the couple self-deliver in the back of their Saturn sedan. 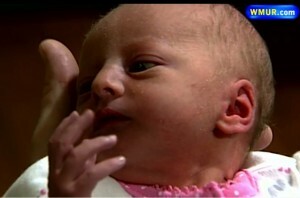 After Katie’s delivery, EMTs transported both mom and baby to the Concord Hospital. Speedway officials said the last time they checked, mom and Katie, who was just over five pounds, were doing well. Since Katie was the first baby to ever be born at the Speedway, Jerry Gappens, Speedway General Manager, gave Katie a very fitting gift – one that took her love for speed into account: NASCAR tickets for life. Mom Welcomes Two Sets Of Twins; Same day – Four Years Apart!